Is this some too-clever-by-half Scream 4 allusion to Marshall McLuhan (“the medium is the message)? Who needs the author of The Gutenberg Galaxy in an era where “nobody reads anymore,” as one character here puts it. That may be so, but they sure do talk. Kevin Williamson, the man responsible for the first two Scream flicks, returns as if he’s paid by the word. Jesus, nobody ever shuts up in this, the fourth and extraordinarily painful installment of the self-referentially-winking series. Less is more, and this more is considerably less. If an endless word babble reference of every classic horror movie floats your boat, feel free — but it’ll capsize the rest of us. 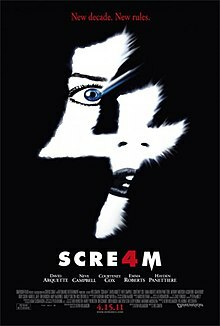 Scream 4 is an appalling cash-in — even by the seemingly bottomless well of horror sequel cash-ins. But it’s notable for one thing. Everything is meta. Its meta is meta, there’s even a reference to the act of being “meta” (sadly, no reference to ex-baller/LA Laker, Metta World Peace). Its meta drives an orbitoclast smack into your orbital lobe. 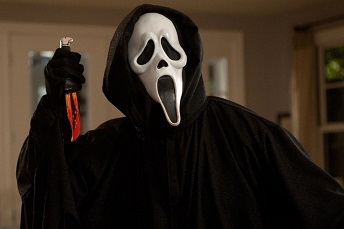 Scream (the original), was undoubtedly solid, sharp as Ghostface was stabby, and playful to boot. Unfortunately, its legacy is tarnished because for a while in the 90s, we suffered many films that tried to encroach on similar comedy-horror territory. So it’s odd that this installment, Scream the 4th, upped the “look at me, I’m so clever” ante, when it was meant to have been a return to form. Featuring a bunch of ever-telegenic TV cast-offs (people from The OC/90201, etc, etc and even Anthony Anderson, pre-Blackish) the film’s saving grace is the steely determination of Neve Campbell. She’s quite excellent, even if she’s acting in a different movie entirely. In 2013, Harvey Weinstein, while speaking at the Zurich International Film Fest, expressed interest in making a fifth and final installment of Scream. Luckily for all of us, he’s no longer in the movie biz. This entry was posted in Horror and tagged 2010s movies, Sequels, slasher films, terrible movies by Really Awful Movies. Bookmark the permalink. I actually like this one. It’s not on the same level as s the first two movies in the series, but far better than the third. Then again, I tend to gravitate towards meta horror flicks.